With drought comes potentially catastrophic bushfire conditions. Farmers are on the frontline - should the Rural Fire Service act earlier? BUSHFIRE has hit too close to home for many NSW producers in recent years. Now farmers are putting pressure on the NSW Rural Fire Service (RFS) to change the way it manages these fires by taking early and strong action. Bushfire management has come under repeated scrutiny from NSW Farmers. At the Association’s annual conference earlier this year, a motion was put by the Dubbo branch to insist that “early action to extinguish bushfires must be the priority for the RFS”. There was criticism from some members about the RFS enforcing ‘Watch and Act’ bushfire alerts, rather than taking emergency action. The motion further called for the RFS to prioritise local input and knowledge. The Association has already successfully pushed for a coronial general inquiry concerning the Sir Ivan Bushfire, which burned 55,000 hectares of Central West agricultural land, razing dozens of homes and killing thousands of livestock, in February 2017. Farmers have expressed concern about “inadequate communication” between the RFS leadership team and those on the ground. This year, with almost 100% of NSW declared to be in drought over the winter, 74 local government areas across the state brought the statutory Bushfire Danger Period forward from the usual 1 October to September, or even to August. Now, in November, the whole of NSW is in this Danger Period, with the catastrophic conditions from last year and the fires they caused front of mind. 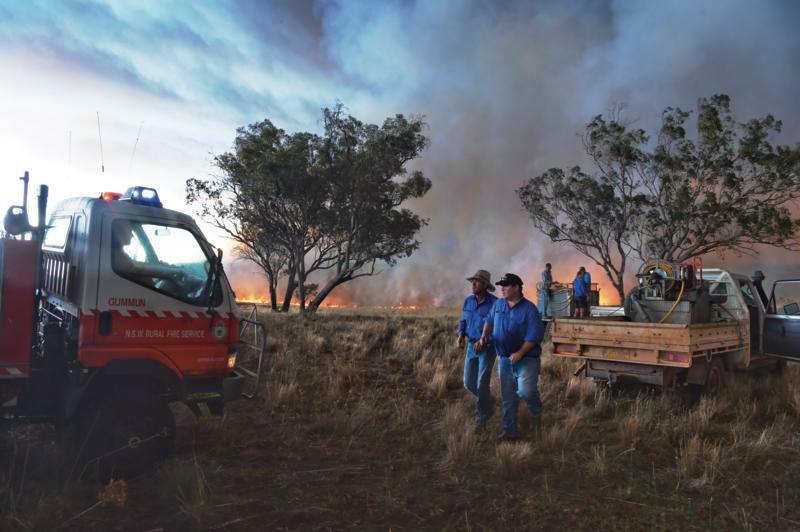 Farmers not only have their livelihoods to defend but make up a big proportion of the more than 70,000 volunteers who serve in 2,029 brigades across 47 districts in the RFS, which is the lead combat agency for bushfires in the state. Those working on the frontlines say volunteer engagement with the RFS, in terms of fire preparedness and response, is essential to prevent and quickly control fires. NSW Farmers’ executive councillor Graham Brown is one such volunteer. On Australia Day 1985, a fire swept through Graham’s property near Orange, burning stock, fences and infrastructure. Since then, he has been active in the development of bushfire prevention and response across the state. Graham is NSW Farmers’ representative on the NSW Bush Fire Coordinating Committee and serves on his regional bushfire management group. "I was determined from 1985 onwards to make sure we did start to implement strong positions on bushfires, where we knew what we were doing, when we were doing it and why we were doing it. I remind people sometimes that when you have been burnt out it gives you a very different perspective of what is going to work and what isn’t going to work,” he says. One catalyst for change was the Goobang National Park fire near Dubbo in 2001, which spread to neighbouring grazing country. Affected farmers took legal action against the state government, which managed the park, arguing that it could have done more to prevent the destruction of farming property. After that incident, Graham says local farmers, the RFS and government spent close to 10 years implementing risk plans for fire zones across NSW. Graham says the bushfire response process that is now in place is effective, but it relies on the right leaders, education and engagement. “We proved the key to it in the Canobolas zone [near Orange] was to engage with landholders. We hold meetings, we go out to the landholders in their own area, pre-season and post-season, and we talk to them about fires we have had and how they have been handled and what we could do better – to me that is the key to the whole exercise. RFS Superintendent Corey Philip, district manager of the Castlereagh Zone in Central West NSW, has worked on two major bushfires in the past five years. The zone takes in the Warrumbungle and Gilgandra local government areas, which includes some of the land hit by the Sir Ivan Bushfire last year. The NSW Rural Fire Service using the Sikorsky Erickson Air-Crane to fight large bush fires and protect property in difficult terrain in the Blue Mountains NSW. Superintendent Philip says the RFS will support what comes out of the coronial general inquiry into the blaze, and a lot of lessons have already been learnt and implemented in the zone. “The key thing that came out of it was the community’s awareness of what ‘catastrophic’ fire danger ratings means – when fire starts under catastrophic conditions it is unstoppable,” he says. Superintendent Philip says another lesson from the Sir Ivan Bushfire is the complacency around heightened fire danger ratings. Locals need to prepare for the associated risks by putting a plan in place should a bushfire break out nearby. Between 90% and 95% of volunteer firefighters in Superintendent Philip’s zone are farmers, he says, and he agrees with Graham Brown that landholder and community engagement is key to effective bushfire prevention and response. “Out here, that means landholders being involved and being part of the brigade, as well as being prepared on our farms with fire breaks or slashed paddocks,” he says. 90% of bushfires start from lightning strikes. During the statutory Bushfire Danger Period, landholders who want to light fires require a free permit from the RFS, and notification at least 24 hours in advance. However, in the case of dead and diseased livestock, either after a bushfire event or an alternative cause of death, there is a faster processing time and farmers should contact the RFS to establish a plan. Central Tablelands farmer Mitchell Clapham has been a volunteer firefighter for about 40 years, and has spent the past year as captain of his local brigade. He also sits on NSW Farmers’ Conservation and Resource Management Committee. Mitchell says many farmers were left disillusioned by the restructure of the NSW rural fire services in the 1990s, from Bush Fire Services – where brigades were primarily led by rural people and local councils – to the RFS, a public entity with a single chain of command. He believes a lot of local knowledge was lost, and there is now a hesitation by the next generation of farmers to become involved because of the “red tape”. The fire danger rating system. “We have seen it a few times now when we’ve had fairly serious situations and there has been a lack of inclusion of the local knowledge in fighting fires – knowing where to go, what the terrain is, where the tracks are,” Mitchell says. “They seem to go back and run things from the office rather than try to seek the input of farmers on the ground who know every nook and cranny of the area. “Historically, when we started fighting fires, a captain in control on the ground could use judgement and make decisions, but now they have to take orders from higher up and sometimes panic ensues. The ‘Watch and Act’ alert level has been enforced when there could have been more done on the ground by people who know what they are doing. "We have to continue to push for more use of local knowledge and for our district commanders to get out and understand their brigades and their captains better than they do,” Mitchell says. The RFS has prepared the FireWise guidelines and checklist to ensure land owners have the best fire plan in place for their property. Ahead of the fire season, work with neighbours to mow, graze, cut or plough firebreaks. Avoid trees and make breaks around buildings, crops, pastures and fences. Have pumps, hoses and fire extinguishers on your property and keep them accessible when working away from the main homestead area during fire season. Do regular maintenance and upkeep on machinery to avoid potential for sparks. Avoid using machinery on heightened fire risk days. Put all petrol, fuel and chemicals inside sheds or safe storage areas to reduce risk of ignition. Keep grass short near buildings and move wood or other material away from infrastructure. Trim branches away from powerlines or rooftops. Have a plan for livestock in case of a fire, including refuge paddocks that are easily accessible and are safe to operate in. Use the RFS’s Farm FireWise guidelines and checklist to make sure you have the best plan in place for your property. Go to rfs.nsw.gov.au and search ‘guide to Farm FireWise’. The penalty for recklessly or intentionally causing a bushfire is up to 14 years in prison, while anyone found to have lit a fire on a Total Fire Ban day can be fined $2,200. This escalates to $132,000 or seven years in jail if a fire is allowed to escape a person’s property on a Total Fire Ban day. But NSW Farmers is worried that would-be arsonists do not know how severe the penalties can be. A motion was carried at NSW Farmers’ annual conference to ask the RFS to more actively publicise penalties, perhaps through large signage stating the jail terms and fines, and reminding the public to call 000 if they see any sign of fire, or Crime Stoppers to report suspicious behaviour. The NSW Farmers Rural Affairs Committee discussed these recommendations with RFS Commissioner Shane Fitzsimmons and Jason Heffernan, RFS director of response and coordination, at a meeting in late September. Committee member Graham Brown says it’s a case of educating the community, and the RFS is launching a strong campaign for this season.